We have two dogs. Stanley and Stella are Yorkies rescued from a puppy mill. Stella is a sweetheart. Stanley is a comedian. His hind legs get ahead of him, so he walks sideways like he’s drunk. And Stanley has only four teeth. They’re all snaggle. So when we were thinking about a new name for our company, I couldn’t get Stanley, and his four snaggle teeth out of my mind. Then like a bell that rang clean and clear, I heard “Fafoutee”. 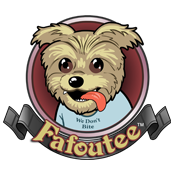 Fafoutee (spelled phonetically) is the Greek word for toothless. The tag line followed effortlessly: We don’t bite. Many thanks to Christopher Ochs for the logo and animation. Chris took my concept drawings and turned them into exactly what I was envisioning. This entry was posted in Fafoutee, Small Business, Social, Social Media, Video, Video Production, Web, Websites and tagged branding, ideas, Yorkies.